On the subject of ‘forgotten men’ as we covered earlier re: Jamie Murphy, another senior man in the Rangers squad has rather faded without even rising in the first place. 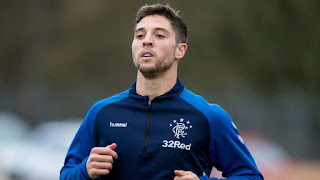 USA’s Matt Polster was signed in January amidst very little hype at all – no one appeared that excited about a Chicago Fire player on trial at Auchenhowie then winning a deal. Somehow trialists never really inspire fans’ imagination because if the player was ‘all that’ he wouldn’t be struggling to find a club. However, they do work out occasionally – Jason Holt served us well in the Championship, and Andy Halliday has done overall not badly at all, despite his limitations. But Polster hasn’t yet made a match-day squad following an untimely injury which ruled him out of what was supposed to be his debut against Dundee following his ‘up to speed’ spell where manager Steven Gerrard confirmed he was weeks behind the rest of the squad. Polster mercifully made it through 90 minutes yesterday without harm, and will be hoping to bounce on from here and assert himself in the senior squad for the split, at least on the bench. By all accounts indeed he had a very decent match too, as did most of Graeme Murty’s side who ran out comfortable 2-0 winners. But Polter’s belated arrival on the scene does seem to be another example of the damned luck or bad judgement of Rangers’ (and Gerrard’s) scouting network. For all the good signings, and there have been a fair number, the like of Eros Grezda was signed in the middle of a terrible injury, and Polster, four months on from joining, still hasn’t gained enough fitness to feature in a senior squad. Of course, you will always get injuries, it’s part of the sport – but Stevie has been engulfed in them at times this season, and signing a player whose biological ecosystem was on an entirely different clock to ours was one heck of a risk. Ultimately, it’s not been too much of a problem because James Tavernier has pretty much nailed on the RB slot, and Rangers are hardly short for midfield options. But Polster is a wage, and by all accounts a very, very fine player and the sooner we start to see some return on that, the better. Hopefully the best right back in the league is gone , we lose all his assists and goals and replace him with a guy none of us have seen play .If you didn`t read some of the crap written by our " supporters" you just wouldn`t believe it .Polster was not a risk as he wouldn`t have cost very much and we have time to get him ready for next season , its called building a squad , everyone is different and for every Polster you get a Kamara who is ahead of where we thought. By the way his good performances in the reserves have been in right midfield NOT right back.